Thomas Bachelder is a Canadian winemaking superstar on a mission when it comes to cool-climate Chardonnay and Pinot Noir. After studying in France and having a successful winemaking career in Canada, Thomas started his own label where not only does he make wine in Ontario, but he also has vineyards in Burgundy and Oregon. The Bachelder project started with the 2009 vintage with the three terroirs series: Three regions; Three wines. As he describes it, the hands, techniques and the palates remain the same, only the terroirs change. When did Thomas realize he wanted to make wine? What is the story behind the Domaine Queylus Grande Reserve? Why does Thomas advocate for a 100% organic winemaking process but no certification? Are there region-specific issues that arise with organic winemaking in Ontario? What’s the difference between organic and biodynamic wine? Why is it important to monitor copper levels even in an organic/biodynamic winemaking process? Does organic winemaking always mean natural fermentation? Are there differences in the requirements for organic certification bodies? Why does Thomas prefer to use wild yeast? Are organic wines better for us? Do organic wines cellar well? What is dry extract and what role does it play in winemaking? Why do the great winemakers use oak to barrel-age and not “to oak” wine? Why is it so difficult to writing tasting notes about wine texture? What are the best food pairings with pinot noir? Is pinot noir or chardonnay a better pairing for cheese? Is there any truth to the idea that you should have white wine before red? How can you use the “sacrificial lamb” concept for dinner parties? What convinced Thomas that growing cabernet in Niagara was a good idea? How does blending merlot with cabernet and vice versa help their flavour profile? What are our tasting notes for a selection of Queylus and Bachelder wines? How do the harsher winters of Niagara affect different grape varietals? How is Canada performing as a player in the international wine market? Should you always stick to drinking and buying organic wine? Welcome to episode 17! 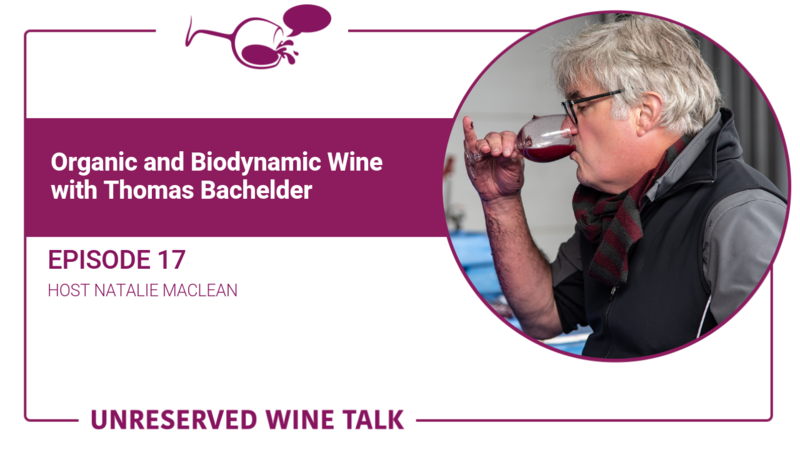 We’ll be chatting with winemaking rockstar Thomas Bachelder about organic and biodynamic wines: what are they, do they taste different and why should we care. I’m so glad that you enjoyed that episode and my online wine and cheese classes Deb! You can find Deb and her tasting party business at www.tastebudswine.ca. Check her out as she’s a dynamo! Now, back to this episode. Thomas Bachelder is winemaking superstar. Not only does he make wine here in Niagara, Ontario, but he also has vineyards in Burgundy and Oregon. This is a man on a mission when it comes to cool-climate Chardonnay and Pinot Noir. The Bachelder project started with the 2009 vintage with the three terroirs series: Three regions; Three wines. As he describes it, the hands, techniques and the palates remain the same, only the terroirs change. He joined me from his home in Niagara. There’s a bit of an echo on his end, but the content is so good that I didn’t want to skip this conversation or edit too heavily. So I hope that you’ll find this worthwhile too. You can also watch the video interview with Thomas that includes bonus content and behind-the-scenes questions and answers that weren’t included in this podcast. I love how Thomas takes the esoteric, sometimes woo-woo subject of biodynamic viticulture and makes it practical. As he points out, why wouldn’t plants be affected by the solstice and equinox when wolves howl at the moon? And may I add, it’s also long been known that women’s menstrual cycles are tied to the moon phases, as are the tides. We may not see it, or be aware of this connection, but it’s there and it’s powerful. Thomas uses wild yeast not so much for the sake of being organic, or biodynamic, as he does for the complexity of flavours that it helps to create in the wine. Homeopathic, or extremely small, doses of certain mixtures can help the plant heal itself rather than relying on the medication, if you will, to do the entire job. Old vines buffer out extremes in vintages as they’ve been around long enough, and have vines deep enough, to compensate for conditions like extremely hot, dry, cold or wet years. You’ll find links to my wine reviews of Thomas’s wines in Niagara, Burgundy and Oregon in the show notes at nataliemaclean.com/17. You’ll also find links to the social media channels for both Thomas and his wineries plus bonus tips for this episode at nataliemaclean.com/17. My next guest on the show will be the author John Mahoney who has written several books on wine, but we’ll be focusing on his latest: Is Wine the Source of Civilization? Spoiler alert, the answer is yes. But the more interesting question is why? We’ll explore that in the next interview.